Britain’s Traynor reigns supreme at Mattoni České Budějovice Half Marathon. Meanwhile Czech runners deliver record performances. For the first time in its history, the Mattoni České Budějovice Half Marathon has a European winner. 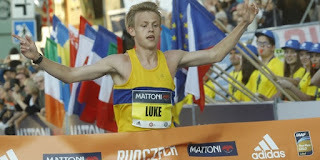 Thanks to the EuroHeroes initiative designed to promote the development of athletics on the Old Continent, Britain’s Luke Traynor picked up first place (1:03:42), with victory in the women’s category going to Moldovan runner Lilia Fisikovici (1:13:20). The České Budějovice race also proved successful for Vít Pavlišta and Kristýna Dvořáková producing new race records among Czech runners. This year’s IAAF Gold Label in the South Bohemian capital drew elite runners from all over Europe, thus continuing the EuroHeroes initiative – a collaborative project between RunCzech and the European Athletics Association. At the helm right from the start was hot race favourite - Britain’s Luke Traynor along with Ukrainian runner Roman Romanenko, winner of the previous RunCzech race Mattoni Karlovy Vary Half Marathon. Both managed to get ahead of their rivals early on, running together for the majority of the race, leaving everyone in suspense right until the last few kilometres. In the end the British runner proved himself the stronger of the two. “We ran together right from the start, Roman kept up with me for practically the whole race, but I felt I had a bit extra to give and in the end managed to speed up a bit. Although I’m a bit tired, I have to say I really enjoyed the race, the atmosphere was fantastic, with loads of fans along the course and I’m also delighted with my finishing time. Even though my personal best is two minutes faster, it’s still a good time on this course which is a tad tricky, ” Traynor revealed speaking of his stellar performance of 1:03:42. Roman Romanenko crossed the finish in 1:04:05 followed by Austrian runner Valentin Pfeil (1:05:08). In terms of the women, overall winner Lilia Fisikovici, who flew in from Moldova, had nothing but praise for the race. She was also completely bowled over by her result. “I’m slightly in shock, but really delighted. I absolutely loved the city, the fans were amazing and I also ran really well. At the seventeenth kilometre I felt I could speed up a bit, overtook my rivals and managed to stay ahead right till the finish,” shared the delighted winner. She finished in a time of 1:13:20 followed by Olha Kotovska from Ukraine (1:14:14) with the race favourite Italy’s Rosaria Console finishing third place (1:14:38). Assuming first place on the podium among the Czech women was Kristýna Dvořáková who delivered a great performance from start to finish. Finishing second among the Czech women and fifth overall in that category was Marcela Joglová (1:19:11) followed by Ivana Sekyrová (1:20:58). 3 252 runners took part in the Mattoni České Budějovice Half Marathon. A total of 2 913 took part in the dm Family Run.